It had all started in such an innocent way. Stephanie asked me to join her to the Stoffenspektakel, a massive fabric fair that travels around the Netherlands and Belgium and urges loads of people to spend money. I had been there once before and was a little weary of the crowd, but the nice company lured me in! We asked the rest of the people we met in brussels to join us, but they were all doing sensible things like 'saving money' or 'stashbusting'. Boo! I did manage to reel Hanne in, who sadly missed out on the previous blogger meet. She had to leave pretty early on, so Stephanie and I agreed to drag ourselves out of bed early and meet at the train station. Foxes. On a knit. She said she'd make it into a dress immediately, I'm curious! Yep, those are flamingos. We made her pose like one as well, because that's what you do in a crowded fabric market! I don't know how many times she said 'flamingos' today (it doesn't sound like an actual word anymore). Both Hanne and Stephanie found some other goodies, but I didn't really see anything with my name on it. 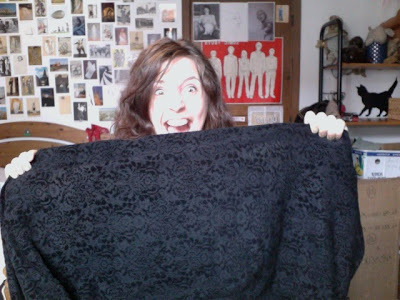 After absent-mindedly petting a black knit with a flocked brocade pattern thinking 'hey that's nice' and then moving on I realised that it WAS a very nice fabric, and that it would make a great wintery mission maxi dress. I went on a search for the fabric but my hungry brain failed to remember where it was and I left without buying anything. Or so I thought. After lunch the girls both took a train home, and I impulsively went back to the market to see if I could find it with food in my belly. 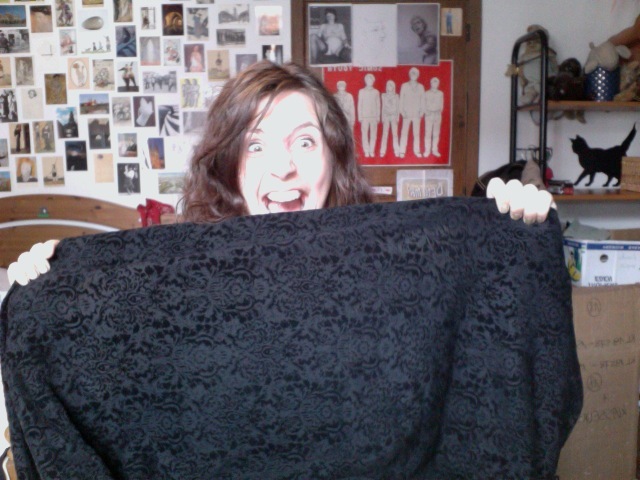 It's hard to photograph, the fabric is a lot darker and richer looking in real life... It's a very stable knit, and I think it will do perfectly well in my planned fall and winter wardrobe. tldr: this was an awesome day and we all bought fabric. That's what happens when you have people in common! I loved fabric shopping with the both of you and look forward towards more meetings! Nice purchases! In the beginning, I thought that you fabric was lace! Would love to visit this shop once I move back to Europe! Thank you! It's actually a collection of shops having stands in one big convention hall, travelling around a few countries. I think they visit Antwerp twice a year or so. Oooh looks good! Shame I had to miss it, but if you would see my room at the moment (pre washed fabric everywhere) you would agree that not going was the best plan for me! Ah, how fun!! I love fabric shopping and I swear it's even better with other sewing enthusiasts. Great finds! The market sounds like so much fun! I will have to meet up with some sewing bloggers some time and go fabric shopping!